Online training has grown so much in recent years and as a result, there has also been a rise in learning management system functionalities and features, many of which are aimed at making it easy to rapidly create and launch content. Even with little to no technical experience, training managers can turn to an LMS such as eLeaP and create professional-quality employee training, and have it up and running in a matter of hours. 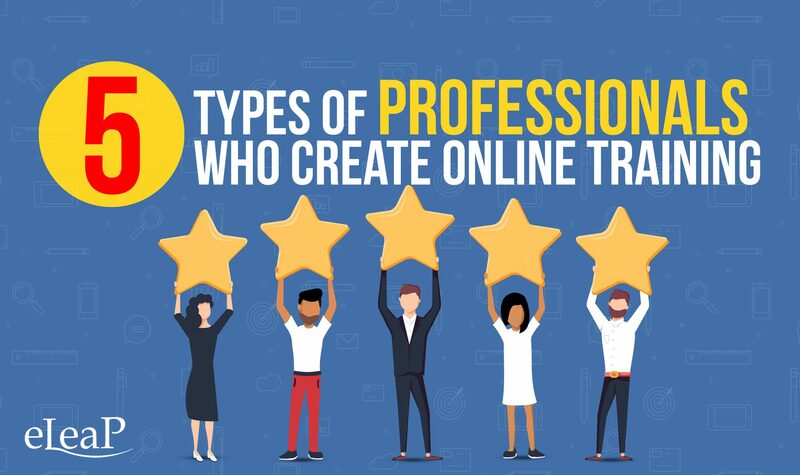 Despite these advances, many companies do work with outside professionals, particularly freelancers and contractors, if they want more professional expertise, experience or know-how when developing content. You may choose to work with a freelancer on just one area of your training creation or hire people to create all of the content. An instructional designer can become the foundation of an online training project. An instructional designer’s primary objective is to take curriculum and training content and turn it into a learning program that will meet specified goals and objectives. A good instructional designer should be someone who not only has a technical understanding of how to create top-quality e-Learning, but also someone who can produce desired outcomes. While each professional designer’s process will vary, a general outline of the work completed by this person includes assessing overall employee training needs, looking at the background of trainees, determining goals and objectives and how they’ll be addressed, and then creating content, strategies, and assessments. Depending on the scope of your e-Learning project and what role you want an instructional designer to take, they could do anything from designing complete multimedia-centric e-Learning courses that span a range of materials, from simple designing of basic training courses delivered via an LMS. Instructional designers should have a strong knowledge of not just the technicalities that come with creating coursework but also learning theories and principles that will impact the effectiveness of training. The work of an instructional designer may also extend to coaching company leaders on how to best implement certain learning applications, and then also evaluating the effectiveness and ROI of training. A subject-matter expert (SME) is a professional who specializes in or is considered an authority in a certain area. A subject matter expert can be vital to the process of creating e-Learning and employee training, particularly if it’s in a highly technical or specialized area where training developers may have little or no knowledge. Subject matter experts focus primarily, if not entirely, on the actual content of training and the subsequent assessments it may include. An SME may be hired to take on the entire content creation process, or may just come on board to check the accuracy of content. Broad training may include several SMEs working together. For some companies, it may be possible to avoid outsourcing the role of an SME, to instead hire internally from a pool of senior employees with a strong knowledge of the content that will be included in the training. Even if you have the technical skills to create the basics of an online training course, you may lack the writing and communication skills which are necessary. A content writer is someone who may not specialize in the area you’re training employees on, but can work alongside either your internal team or your outsourced team to do the writing found throughout coursework. In addition to writing the words seen on the learner’s screens, content writers can also craft scripts for multimedia elements included in training. The benefits of outsourcing the writing include the ability of a content writer to keep messaging short, concise and to the point. Content writers can also maintain the tone you set forth for all written materials in training, so there is a sense of cohesion and flow throughout coursework. A graphic designer is someone who manages the visual communication of your e-Learning, which is incredibly important. Most people are primarily visual in their learning process, and graphic designers understand the in’s and out’s of how to engage an audience in the right way, keep attention focused on pertinent information and deliver a professional and visually appealing course. Some of the areas graphic designers focus include typography, space, image and the use of color. Working with a graphic designer allows you to determine the right combination of text styles, colors, and sizes, and how to layout a screen so that it meets the objectives you’re seeking. Whether it’s managing how much white space is present on a screen or ensuring a trainees’ eyes are drawn to just the right spot, outsourcing a graphic designer can be extremely valuable when creating online training. Aside from understanding and implementing learning theories, graphic designers can also choose the right pictures to make the most impact on learners, and can create animations and other types of graphics which improve training engagement. Working with a graphic designer will create a logical flow in your e-Learning, will make it readable, make navigation intuitive and ensure the primary message is conveyed to learners in the best way possible. Creating videos that are engaging and have strong production quality can be challenging, which is why some companies may turn to instructional video production professionals. While videos can certainly be made in-house when this area of an e-Learning project is outsourced you are likely to get your video created much more quickly because the team is going to be ready to go instantly with equipment and expertise. Additionally, when you pay to outsource instructional videos you can save money in the end because everything is embedded in the cost of production, including filming, directing and editing. When you rely on in-house video production, there may be training required and a learning curve that can be expensive and slow projects down.